Macworld, an annual event in San Francisco brings together the leading companies engaged in the world of Apple, will take place next week. Those responsible for Macworld / iWorld 2013 we have just confirmed several guest artists who bring a touch of glamor to this edition, which will open next Thursday January 31. Actors Ashton Kutcher and Josh Gad will come to the stage on Thursday at 9 am to discuss their interpretations of Steve Jobs and Steve Wozniak in the film 'Jobs'. The film will premiere this week at the Sundance festival closing. But these are not the only guests who will attend class the most important exhibition of the year dedicated to the world of Apple. Singer will.i.am of the Black Eyed Peas, will appear the same day, at 11 am, with Brian David Johnson (Intel) to talk to us about technology and future applications. We are convinced that will.i.am attends this event to speak also of accessory that has launched recently and used to improve the iPhone's camera. The invention costs more than $ 300. In Current iPhone this year will monitor all events occurring at Macworld. 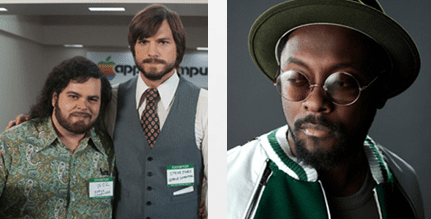 Article Ashton Kutcher and will.i.am attend next week at Macworld was originally published in News iPhone .